As a member of our Golf Club you will receive your Derbyshire County Golf card. If you are a visitor in possession of a card you will be able to make use of it. What is the County Card Scheme? 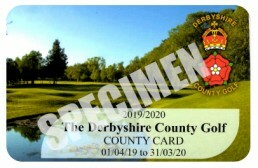 The Derbyshire County Card Scheme enables Members of Affiliated Clubs, to play at other courses in Derbyshire and throughout most of England, at reduced Green Fee rates – sometimes by as much as 50%. The scheme mirrors those that have been adopted in most County Unions and provides benefits to Club Members, Clubs and the County Union. Unlike Commercial 2 for 1 schemes ALL the income generated by the County Union goes straight back into the game at grass roots level by giving all our juniors a greatly reduced affiliation fee and to assist with the cost of coaching all our junior squads at u12, u14, u16 and u18 level. Where can I use my County Card? Alfreton Golf Club, Allestree Park Golf Club, Ashbourne Golf Club, Bakewell Golf Club, Brailsford Golf Course, Breadsall Priory Golf & Country Club, Broughton Heath Golf Club, Burton-on-Trent Golf Club Ltd, Buxton & High Peak Golf Club, Cavendish Golf Club, Chapel-en-le-Frith Golf Club Ltd, Chesterfield Golf Club Ltd, Derby Golf Club, Erewash Valley Golf Club, Glossop & District Golf Club, Hope Works Golf Club, Horsley Lodge Golf Club, Ilkeston Borough Golf Club, Kedleston Park Golf Club Ltd, Matlock Golf Club, Maywood Golf Club, Mickleover Golf Club Ltd, Ormonde Fields Golf Club, Pastures Golf Club, Shirland Golf Club, South Chesterfield Golf Club, Stanedge Golf Club, Tapton Park Golf Club. Berkshire, Buckinghamshire & Oxford (BBO) , Bedfordshire, Cambridgeshire, Cheshire, Cumbria, Derbyshire, Devon, Dorset, Durham, Essex, Gloucestershire, Hampshire, Hertfordshire, Kent, Lancashire, Leicestershire & Rutland, Lincolnshire, Middlesex, Northamptonshire, Northumberland, Nottinghamshire, Shropshire, Somerset, Staffordshire, Surrey, Sussex, Warwickshire, Wiltshire, Worcestershire and Yorkshire. These County Unions have over 1,100 Clubs between them. How much does the County Card cost? For men, the card is in included in their affiliation fee. For Ladies, they may use a Free Derbyshire Card in any of the affiliated Clubs in Derbyshire. To use the Card nationally they will need to contact the County Secretary (Sharon Elliott) and pay £5. With the merger of the DUGC and the DLCGA in 2017, it is hoped to rationalise this in 2018 and make the Card inclusive for both men and women. How do I use the County Card? Bookings must be made in advance with the Host Club. Restrictions on time and day of the week may apply. In general, bookings will not be accepted for weekends or Bank Holidays. County Card Members must have current handicaps and must agree to be bound by the rules of the Club being visited. The County Card may only be used for groups of up to 4 players and may not be used in connection with larger groups or societies. Card Members will be issued with a ‘County Card’ annually, which will contain details of how to contact all Clubs within the scheme. This list will be updated, from time to time, via the Derbyshire County Golf Ltd website. How do I get my County Card? Once affiliation fees have been paid by your Golf Club, cards will be distributed to all members during March and April. The minimum commitment required is to accept a booking of one four-ball group per week on a day or time determined by the Club. The green fee to be charged is entirely at the discretion of the host Club. Typically, the green fee will be up to 50% of the visitor rate, or the same as the ‘guest’ green fee.